Why Put Eggshells in a Pot of Coffee? What Is the Difference Between a Coffee Maker & a French Press? Coffee connoisseurs often prefer the rich, full-bodied taste of a cup of coffee brewed in a French press. Prolonged exposure to the coffee grounds creates a more intense flavor than a standard auto-drip coffee maker. A French press creates an intense cup of coffee. To use a French press, the brewer places coarse coffee grounds in the bottom of a glass carafe. After pouring hot water over the grounds, the mixture is allowed to steep. After brewing for three to six minutes, a plunger is pressed to the bottom of the carafe, extracting maximum flavor from the grounds. In a regular coffee maker, the water drips through the grounds and a filter before filling the pot. Although the brewer can control the strength of the coffee by adjusting the amount of the grounds, there is no way to increase the amount of contact between the water and the grounds. Even when ground at home, most coffee grounds are smaller than the holes in a French press and float into the coffee itself. The filter in an automatic-drip coffee pot prevents any grounds from finding their way into your cup. 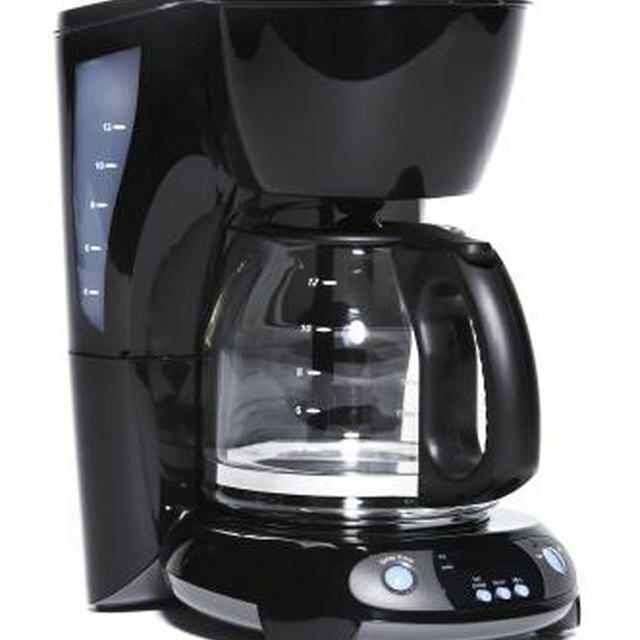 How Much Coffee Do You Need for a 60 Cup Coffee Maker? How Do Percolator Pots Work? Whey Powder: What Is the Shelf Life?